Easy Crock Pot Italian Chops - Recipes That Crock! If you need a super easy recipe to throw together and love Italian flavored meals, then I have quite the treat for you my friend! 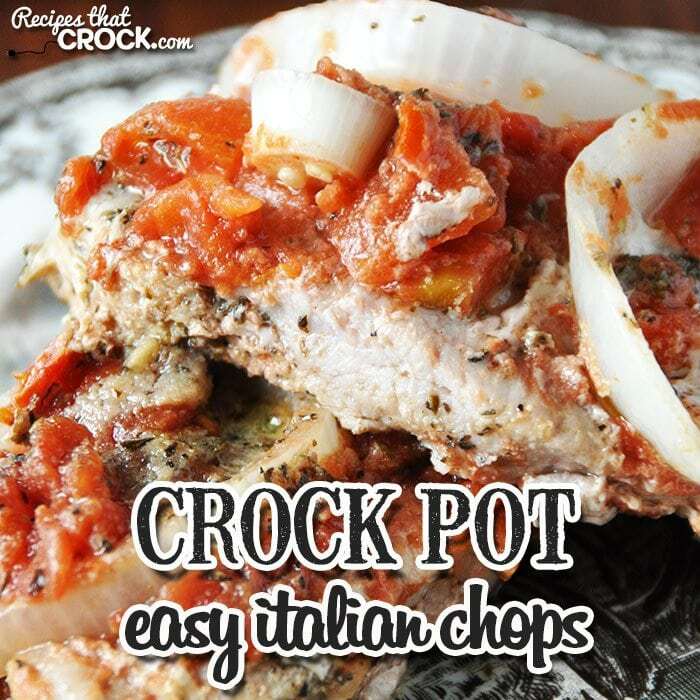 These Easy Crock Pot Italian Chops are going to be your new best friend! 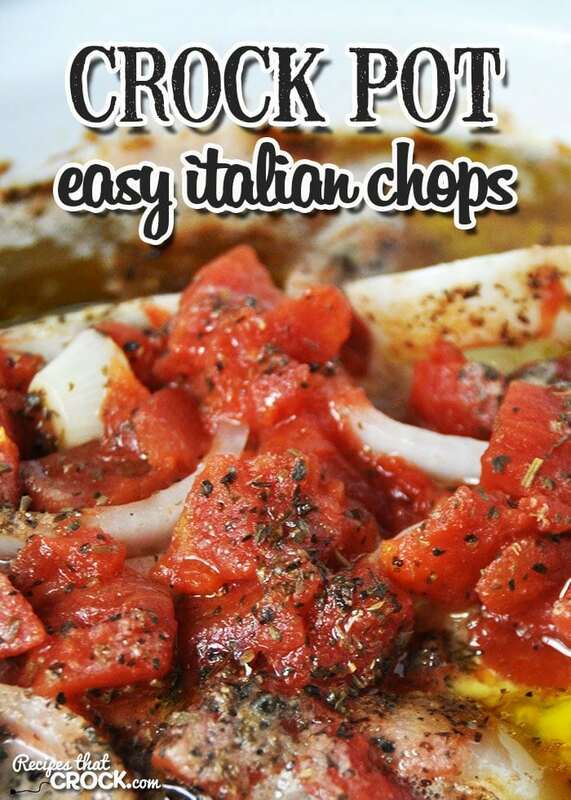 We actually had all the ingredients here at the house for this recipe, so I had Michael throw these Easy Crock Pot Italian Chops on. Now, I will give him credit, he is a good cook when he is making up his own recipe. However, when I ask him to use a recipe, he seems to get a bit skiddish and always seems to have something that needs his attention right away. 😉 This time though, I needed to go to the grocery store, so it was either put it on while I was gone or eat dinner late. And guess what, he did a great job! I mean, come on, I found this recipe in Gooseberry Patch’s 101 Super-Easy Slow-Cooker Recipes. The name of the cookbook has, “You can do it!” written all over it! As you all know, I have had trouble in the past with onions. I am guessing I resemble someone sprayed with pepper spray when the burning from the onions starts. I have had lost of tips and tricks suggested and have tried many. For me, the ones that seem to work the best are keeping my onions in the fridge, keeping myself back as far away from the onions as I can while safely cutting them and breathing through my mouth. I’m not sure there is any science out there to back up these remedies working for me, but if you are having trouble yourself, you might give it a try! I had Michael use Lil Bit (my 2.5-quart crock pot) for this recipe so that the juices would be surrounding the pork the entire time. He didn’t believe that Lil Bit could hold all of the ingredients, but she did a great job! If you don’t have your own Lil Bit, I would recommend using a 2.5-3-quart slow cooker. These pork chops are easy and oh-so delicious! Could you use chicken broth instead of water for extra flavor? I haven’t tried it that way, but sounds good! Enjoy! Just wondering, how thick were your chops? Love your site. ? Thanks so much! My chops were about 1/2 inch thick. Hope you enjoy this as much as we do! Ny crockpot is 5 qt. How should I or can I adjust to get the same flavors? I haven’t tried this in a 5 qt crock pot yet. I think you could use your 5 quart, just watch it closely the first time you make it to make sure it doesn’t affect the cooking time. If you give it a try, let me know how it goes! Enjoy! Does the oil go in the crockpot with the other ingredients and what kind of oil did you use?? Yes, it does. I used extra virgin olive oil. Enjoy! Can the Pork Chops be frozen or do they need to be thawed? I’m just eager to start this recipe and hate to wait! I used thawed chops. If you use frozen ones, then you will need to extend your cooking time. Enjoy! This looks like a delicious way to cook pork chops. Thanks for the recipe! You are quite welcome! I hope you enjoy them as much as we did! I have not tried making it without using the liquid smoke, but it would probably still be okay. If you give it a try, let me know how it turns out! Enjoy! Thanks for the tip! I have never heard that one before! I’ll have to give it a try!